There have been a few times during Neil Lennon’s time at Celtic that I thought he’d leave. Yesterday wasn’t one of those times. It really took me by surprise, although it probably shouldn’t have. The rumours had been flying, and if I’m honest I had a dreaded feeling on the last day of the season when Lennon addressed the fans. The fire just wasn’t in his voice. Only weeks before, at the first home game Celtic played after wrapping the league up for the third season in a row, Lennon was due to join the players on the pitch for a post-match lap of honour and to speak to the fans. The appearance was trailed before the match and even over the tannoy at half time, but once the final whistle had blown, the players took to the pitch alone. It may have been in anger at the disappointing 1-1 draw with Ross County Celtic scraped that day – a fair few of the fans didn’t hang around for the lap of honour either – but I feared at that point that a heavily trailed appearance followed by a sudden no-show was a sign of bad news on the horizon. It all felt a far cry from the last game of the season against Motherwell in 2011 when fans turned out in force despite knowing the league title was most likely heading to Rangers, albeit for the final time. Labi Siffre’s Something Inside So Strong rang out in the stadium, and the fans sang their hearts out. 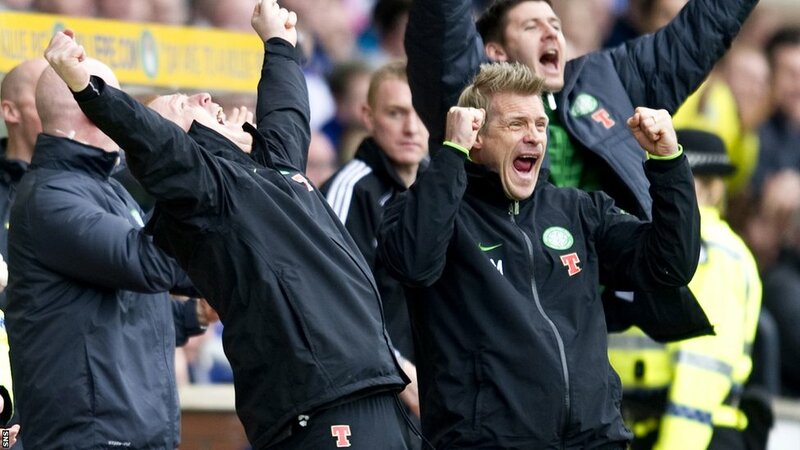 Celtic had lost the league, but we were not beaten, and Neil Lennon most certainly wasn’t. Lennon told us that day that it was only the beginning, not the end, and the passion for his place at Celtic oozed out of him. In the months prior to that game, Lennon had endured an incredible onslaught of abuse, a peak in the bile he had lived with for years first as a player at the club, and then as Celtic manager. In Scotland in 2011, a man from the north of Ireland was fair game for racists and bigots who set out on a journey of making his life utter hell. The plan was to drive Lennon out of Scotland, but to Lennon’s eternal credit, the plan failed. In the face of intense abuse and death threats, culminating in Lennon being sent letter bombs in the post from cowards Trevor Muirhead and Neil McKenzie in March 2011, the man from Lurgan held his head high and carried on doing the job he loved and clearly so badly wanted. When news of the letter bombs broke, I thought he might go. I prayed he wouldn’t; I was encouraged by his management, but mostly I just didn’t want his tormentors to think they’d won. However, when Lennon was physically attacked during a game in May 2011 by Hearts fan John Wilson as Celtic fought for the league title at Tynecastle, I gave in. I gave up any prayers I might have had that he’d battle on this time. It was an incident too far, and I couldn’t see how anyone would expect a man simply trying to do a job he must have dreamed of to continue enduring a relentless, hateful campaign because of his Irish Catholic identity. But he did stay. 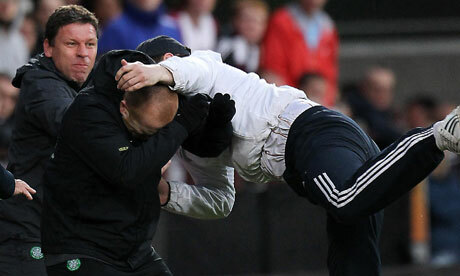 My respect and admiration for Neil Lennon’s strength and determination is beyond words. My emotional memory from that time was one of fury. On top of the very real threats and security-driven life Lennon was navigating with his family, he was treated unforgivably by the media. The ‘he brings it on himself’ mentality supported by Scotland’s sports writers was shameful, and at a time when I was, no less, taking exams in journalism ethics, my own faith in the industry plummeted. At the beginning of season 2011/12 I had high hopes for what Lennon might bring to Celtic after narrowly missing the title in a haze of bullets, bombs and vicious abuse only months before, but it wouldn’t be long before that furious feeling returned. In August 2011, in a decision that continues to leave me incredulous to this day, a jury in Edinburgh found a charge of assault against John Wilson not proven, despite Wilson admitting that he committed the act. Wilson’s attack happened on live television. The pictures were beamed around the world and the life of terror Neil Lennon was living under was thrust into international spotlight. Yet, only three months later, a jury could not return a guilty verdict for the assailant because of an apparent technicality. Lennon was failed by the Scottish justice system, and the country looked a laughing stock on the global stage, although I’m sure there was no laughter in the Lennon household. The Celtic manager had to deal with that travesty just as the new season was getting started, knowing, of course, that the trial of Muirhead and McKenzie was still ahead for him. To add insult to injury, Lennon returned to Tynecastle for an away match in October, less than six weeks after the verdict, to be confronted by a number of Hearts fans who celebrated by bringing John Wilson masks to the game. Hearts beat Celtic 2-0 that day, and I can still feel the anger. The poor result was one of a few early that season. 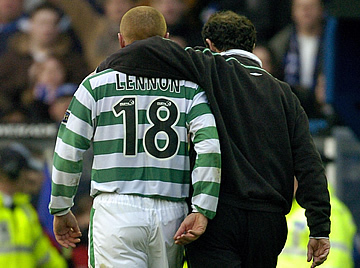 Celtic were falling behind with results and Lennon looked like he was struggling. The media scrutinised his ability, his bottle, everything but the hell he had just been through and the effect that racism and bigotry – and a justice system that didn’t deliver – might be having on him. It seemed that under the inexperienced Lennon, Celtic were heading for humiliation, and even a number of Celtic fans lost the faith. But we needn’t have worried. When Lennon turned it around, he did it in style. Who could forget *that* game against Kilmarnock when Celtic, with the help of a wonderfully on-form Anthony Stokes, came back from a 3-0 deficit to draw level. Lennon himself admitted that his job was on the line that day. It really was that close. Celtic rallied with a 2-1 win against Aberdeen after that game, but faltered again with a draw against Hibs, and we all wobbled. However, it was the next game, an away tie against Motherwell, when things finally swung the other way. The 2-1 victory for Celtic was the beginning of a breathtaking comeback that culminated in Celtic going top of the league in December, just after Christmas, after beating Rangers 1-0 at Celtic Park. Neil Lennon had brought back the thunder, and boy did it roar. I still remember Lennon’s reaction later that season when Celtic wrapped up their first league title under his leadership. His response when Charlie Mulgrew slotted home the first of Celtic’s six goals at Rugby Park against Kilmarnock said it all. That title meant the world and more to him, and the fans felt his emotion along with him. And then there was Europe. The euphoria of the victory against Barcelona at Celtic Park the day after Celtic’s 125th birthday will stay with all of us. Under Lennon, the impossible became possible. Against all the odds, Celtic soon emerged from a group that comprised Barcelona, Benfica and Spartak Moscow, and went through to the last 16 of the Champions League. It was as far as Celtic would go in Europe that season, but it was a darn sight further than we – and ITV sport – had expected. It’s easy to forget how deliriously happy we all were just to have made it to the group stages that season. It was a whirlwind, and it will be hard to top it anytime soon. The comeback against Shakhter Karagandy in the qualifying rounds in 2013 was thrilling and easily the game of the season for me. To come back from 2-0 down in the away tie to grab the winner in stoppage time at home was adrenaline-fuelled Nirvana for Celtic fans. Lennon’s sprint down the touchline to celebrate with his players is a lasting memory. For me, what he brought to Celtic was a restoration of pride not only in our club and what the team could achieve, but pride in our identity, who we are and what we stand for. Neil Lennon endured against all the odds, he walked with his head held high and he succeeded. He believed in himself and his players while he was being belittled and ridiculed by heartless media writers who seemed to gleefully paint him as a pantomime-style villain while people were actually plotting to kill him. He stood up for himself, he spoke his mind and he, in turn, stood up for all of us. We’ll always stand with him. We are all Neil Lennon. Greetings from Maputo, Mozambique where my precious wifi time on twitter directed me to your excellent article. I’m so thankful it did! Your words speak for me. Reading your recollections and the emotional triggers they provoke fair brought a tear to this ‘hardened’ volunteer’s eyes. I’m sure they resonate with many others in the community, not just of Celts, but good minded people the world over. Neil Francis is a beacon to us all, he embodies courage, determination and resilience, as well as passion, empathy and affinity. It is these very qualities that we should all hold ourselves to account by when we look in the mirror. I hope the man from Lurgan allows himself a smile when he next shaves, he should, he deserves too. Excellent piece – wasnt pleased when Neil was appointed, as I felt it was an economic cop out. Always respected the man & the player and enjoyed many good times over past few years. Still get angry about the media indifference to the embarrassing hostility & bigotry, so blatantly directed at an innocent man. He has truly earned his status as a legend at Celtic Park & I applaud his efforts . Interesting to see if we ever find out the genuine reasons for his departure ? Suspect its all to do with budgets & business models, and , the relevance to the CEO’ s bonus ?? ?